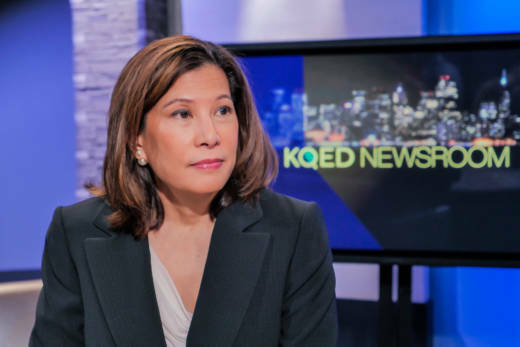 California Chief Justice Tani Cantil-Sakauye defended the recent -- and controversial -- reform of California's bail system in an interview on KQED's Political Breakdown podcast this week. "I can't say too much about (Senate Bill) 10 because if it's litigated, it likely will come before the Supreme Court," she said. "But I will say this -- the process was unassailable." Senate Bill 10 was signed by Gov. Jerry Brown last week. It will eliminate cash bail next October and replace it with a system that relies more on risk assessments of defendants and judges' discretion. The bail industry is starting to collect signatures in an attempt to repeal the law at the ballot box. And some civil rights groups also opposed the final measure, saying it will result in more people being held in jail. But Cantil-Sakauye held up the legislation as evidence of government working well, noting that she appointed a panel of 10 judges and one court executive officer to study the issue for a full year before they made a series of recommendations that she supported. "I purposefully picked very diverse folks -- I picked experienced judges, newer judges, judges from rural and urban counties, judges from metropolitan areas, a judge who had been a former cop or CHP officer, judges who had been a former DA or a former public defender," she said. "They studied it for a year before coming out with recommendations." Then, she said, the legislative branch incorporated the recommendations into a bill, the executive branch was "open minded to it," and the judicial branch provided "information and research that wasn't otherwise available." "So whatever people may say about SB 10, it was a collective three-branch solution. Three branches came together to correct what everyone says is a money bail system that didn't work," she said. Some civil rights groups complained that the final version of the law lets judges keep defendants accused of violent crimes behind bars while they await trial. That process is known as preventative detention -- and critics of the new law have raised questions about its constitutionality. But the chief justice says that policy was a key part of the judicial recommendations. "In our 110 page report by the pretrial detention work group, it addresses this because the United States addressed it," Cantil-Sakauye said. She noted that the U.S. Supreme Court upheld preventative detention in the 1987 case United States v. Salerno.